A key benefit of studying at TUM Asia is the flexibility of choice, where students get to choose their preferred country and industry for the compulsory Master Thesis & Internship semester. 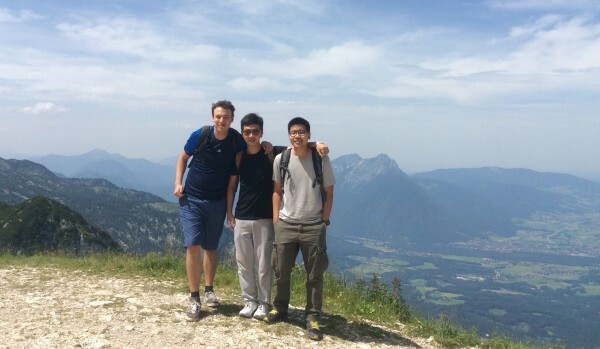 Many of our students who are interested in research choose the opportunity to head north to Munich, where our home campus is. To find out what’s so unique about spending 8 months at TUM, we catch up with Teepakorn Napharatsamee, a native Thai who is enrolledin the Master of Science in Industrial Chemistry (awarded by TUM and National University of Singapore, NUS) programme. Where are you doing your thesis and for how long will you be there? Currently, I am working in the Chair of Construction Chemistry at TUM, in the Chemistry faculty of the Garching campus. I will be here for a total of 8 months. Were you excited to go to Munich? Is it your first time in Europe? Yes of course I was excited! Munich is a wonderful city to live and play in, so I was looking forward to it. This is not my first time in Europe, since I have been to the continent before. However, it will be my first time staying so long in Europe. What did you expect at TUM and was the real experience what you expected? We were lectured by TUM professors during our coursework semesters at TUM Asia so I knew that I can expect to learn from very knowledgeable and skilled scientists/researchers at TUM. Moreover, TUM is one of Europe’s best universities so I have been learning a lot from everyone here, which is what I expected. To my surprise, working in the university is very similar to working in a company/industry. We have 9AM to 6PM workdays and a working seminar every week where we are to present on the progress of our work in the lab. We also submit progress reports every fortnight. This experience has really shown me that the gap between academic research and industry work can be small, and it has really been an invaluable experience being in TUM. Do you think you can migrate there or prefer to come home to Asia? I’m not sure. But I do know that this joint TUM-NUS degree in Industrial Chemistry prepares us to be capable of working in both Europe and Asia, whatever our preference is. What is one thing you really like about Munich? Munich is very clean and safe. Munich is also famous for the Oktoberfest, which was a special experience for me. The surrounding cities and areas also boast of many world-famous tourist attractions, which makes it easy for us to get to. What do you miss about Asia? Definitely the food. I am an Asian afterall! Any advice for students who also want to complete their Thesis at TUM? I strongly recommend it for those who want to do so. There are many new experiences to enjoy and it will be very unique!